The 6 “Practice Powder Kegs”… The cause of Practice EXplosion or the cause of Practice IMplosion. Where he will show you how to make QUALITY of patient care the DRIVING FORCE in ALL your practice growth while radically improving your personal production and profitability without damaging the quality of patient care and without freaking your team out. Dr. John discovered that there are “11 principles” or “habits” as we’ve come to know them… that are really designed to eliminate all the “failure points” in any dental practice. Meaning when the 11 habits are in place you don’t need a special situation, special marketplace, you don’t need charisma or lots of special talents. These “11 habits” work in main street in anytown USA with Dr. anybody. We don’t want you to learn anything that only works for others but not for you. You don’t have to be superhuman and you don’t have to currently be a super-producer. Using these principles Dr. John went from producing $40,000 a month to producing his record high month of $225,000! The Personal Prep: Almost every dentist has a time in their career where they are physically unable to practice at a high level. There is some physical preparation that one can do to have a longer career, to be able to avoid many of the things that can cause temporary disabilities in dentistry. The Technology Trap: Consider the fact that working class people are standing in long lines for the latest greatest $1000 smartphone. New = Better in many of your patients’ eyes. Ignore this reality at your peril.Yet the flip side of that coin is it creates opportunity for gimmicky ineffective yet EXPENSIVE technology to be brought into the practice. Never before has it been more critical to EVALUATE your technology with laser precision. Get the right stuff and your patients are thrilled and engaged and happy to pay for your services. Get the wrong stuff and you just needlessly empty your bank account. The Case Presentation Puzzle: The days of patients just coming in and following your “all knowing doctor instructions” are long behind us… and equally as outdated and now harmful is the “pushy used car salesman sales tactics.And the truth of the matter is there’s a better way that works BOTH for the patient and the doctor. The Capacity Crisis: Most practice want new patients. But the ugly reality is most practices can’t handle new patients. We will look at your practice to determine the REAL capacity and how many new patients you can REALLY handle. The Clinical Explosion Training is an Advanced Master Class that was created to be dripped out one lesson per week for 8 weeks. Each week there is a small “homework” assignment that you will use to build on for the next module. 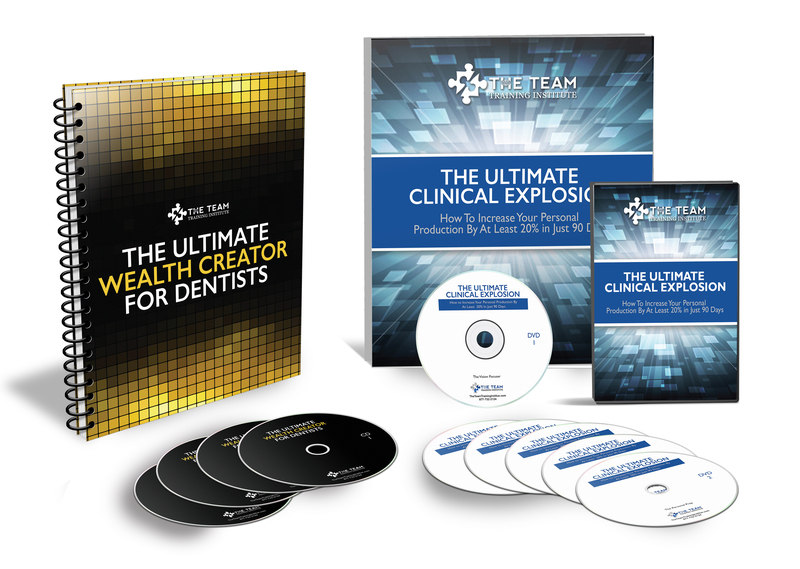 If you’re a dentist who’s been in practice for more than 24 months and you feel tired when you wake up in the morning or you feel frustrated with the disparity between the herculean effort you’re making compared to the income that effort is producing. If you think your personal production should be or could be higher but don’t know exactly what action steps to take. And you want to RADICALLY reduce the daily “friction” that drains your energy, saps your teams productivity and in turn double or even triple production and profit levels in your practice while simultaneously quadrupling your vacation time… Then let us hold your hand and show you the way! But What If I Don’t Explode My Practice? Dentistry is Dr. John’s life and has been my life since he was born. He take your time and trust VERY seriously. And because of that he is willing to absorb ALL the risk for you… Engage with him in your “6 Week: Clinical Explosion Blueprint” training and see that what he is sharing with you is just scratching the surface when it comes to the ACTUAL explosion you’re about to experience. And not only that take an entire 12 months and see the FULL on transformation that occurs and the STAYING power what I share with you has. If after 12 months you’ve not seen 5x the value we’ve promised just shoot us an email and we’ll refund every penny. Fair ‘nuf?